After three years of debate, in 2008, the State of Uruguay decided to start diversifying the energy matrix by increasing the share of renewable energy sources, especially wind and solar. Although this process has been introduced as a paradigm for the region, the plan implemented for the development of “clean energy,” far from reverting the inequitable tariff model where those with lower incomes pay more, it actually deepened it. In addition, it favored the private companies’ advancement in the electricity sector. The State is committed to buying all the energy generated by private companies at a higher price than that of other sources. In this context, the Board of the Association of Employees of the National Administration of Power Plants and Electrical Transmissions (Aute) has been struggling to implement a model that addresses energy as a human right and a public good, not as a commodity, to be able to improve the quality of life of low-income sectors and protect the real wage. In their struggle, the union activated an internal process by generating participation and training spaces with a class independence approach, and summoned all workers and users to join the debate and the struggle. The period known as the Batllista Reform marked the establishment of the National Administration of Power Plants and Electrical Transmissions (UTE), in 1912. José Batlle y Ordó?ez, who served as president from 1903 to 1915, made use of political, social, and economic intervention tools to nationalize utility companies while great progress was made in the labor field. During that process, the working classes managed to crystallize demands that were at the forefront in the region. Castelgrande states that access to other rights such as drinking water, education, and health cannot be guaranteed without electric power. Furthermore, he underscores that if today energy is a human right that is not universally enjoyed, it is necessary to measure disparities in the exercise of this right to understand the reasons for this reality. In that sense, several studies on fuel or energy poverty in the country were conducted by the union, based on two variables: affordability, i.e. how much it costs, and the user’s access to energy. To that end, they compared residential electricity rates to business rates and made an assessment both in absolute terms (how much they use and can pay) and in relative terms (how much of their income they spend on it). Results showed that in Uruguay 25% of users are energy-poor – that is, they have difficulty paying and having access to energy. According to Castelgrande, on the one hand, companies pay half of the total price paid by any working-class family. On the other, the study shows that the average working-class family spends 4 to 5 percent of its income on electricity, while the poorest spend 10 percent. This contrasts with the wealthiest residential sector in the country, who spend 2 to 2.5 percent. Moreover, for big consumers, that is, large productive enterprises, energy spending represents around 0.4 percent of the gross production value. In short, a working-class family in Uruguay pays 10 times more for electricity than a businessman. “They are prioritizing goods over rights, which shows rates are very unfair,” said Aute’s undersecretary. 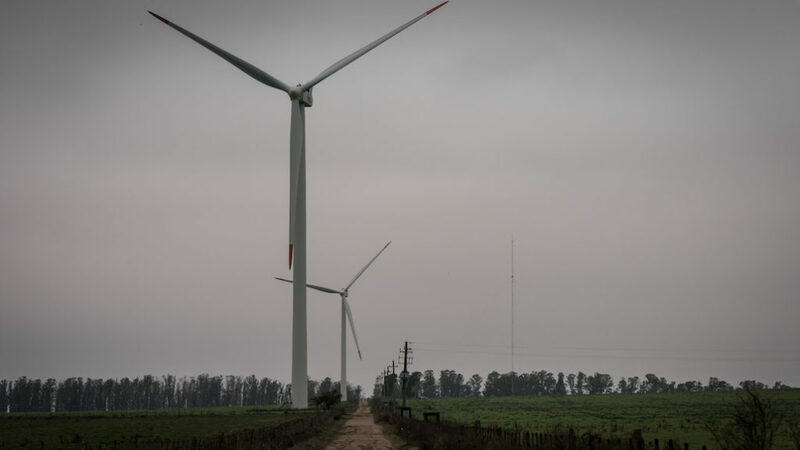 “Not only does this strategic policy designed and approved by all political parties in Uruguay to be applied until 2030 give continuity to these injustices, but it also deepens the commodification of energy,” he said. In the same sense, the “Analysis of electricity rates” issued by Aute in 2016 emphasizes that the current regulatory framework fosters the concentration of large players by giving them institutional recognition in the electricity market and granting them greater lobbying power. “Though we have attended heated talks about workers and users’ social participation in the field of education and health, little has been debated in terms of the social participation in the electricity market. Everything suggests that there is a strong underlying reason: a class-based view of participation. It seems like the Electric Market Administration (ADME) has room only for big players and private generators, and no one is judging their role or actions,” stated the union. The Energy Policy proposed by the National Directorate for Energy and Nuclear Technology has been debated since 2005, and it was introduced to the executive branch in 2008. The policy objectives aim to diversify the energy matrix, ensure a self-sufficient energy model, and reduce dependence on fossil fuels. Uruguay boasts explored water, wind, and solar resources that greatly exceed hydrocarbons, the totality of which is imported. Taking this potential into account, representatives from different political parties believed that increasing the electricity input could solve several of the Uruguayan energy issues. Numerous social actors, like private companies, were taken into consideration when planning the changes. By engaging them, the State aimed for technology transfers, skilled labor qualification and growth of industrial capacity. The diversification had to be overseen by the executive branch, but the implementation did not turn out as planned. Aute president, Gabriel Soto, stated that “generating wind power input of 1500?MW by the end of 2016 in a country with electricity consumption peaks of 2000?MW is a nearly a one-of-a-kind ratio worldwide.” However, he emphasized that that incidence of renewable energies was achieved at the expense of “a grotesque and brutal transfer to foreign hands”(1). He pointed out that the State fostered an investment friendly material and legal environment in the tendering proceedings for wind farms, which entitled companies to tax exemptions for US$3.5 billion, and promoted abusive contracts and business models for the people of Uruguay. Is it enough to have government-controlled companies? Should all energy sources be property of the State? Is everything public state-owned? And is everything state-owned public? These are the questions posed by Aute. “We were very well in Uruguay. Our history as workers of state-owned companies went hand in hand with the country’s development in line with the State, and vice versa, but in recent years we have been forced to question a set of issues that were not on our agenda,” says Castelgrande. State-owned companies in Uruguay have a central role, he said, adding, “nowadays, the fact that they are state-owned is not enough. We are seeking to create the conditions for ‘socializing’ companies.” This means adding a new actor to the struggle – the users’ movements; a political leap from a sectoral to a whole-of-society approach. Regarding progress being made in that sense, Castelgrande states that inter-social organizations are being created in neighborhoods, where neighbors, cooperative workers, small traders, students, housewives and workers participate. “These organizations are at the forefront of the users’ movement proposal. And we’ll have to spearhead a big campaign to bring this to life,” he predicted. Through this movement, participants are ?trying to generate an overflow of organized workers to start pushing down electricity rates, as a first step. They want to influence public policies aimed at granting access to energy as a human right, so that energy can be the people’s patrimony. This need was also stated in the Declaration of Montevideo, at the International Meeting of Energy Workers held as part of the celebrations of Aute’s 68th anniversary. “The user’s engagement in the electricity system is another side to the struggle for the recovery of the commons taken away from the people by capital,” he said. He also added, “Energy workers must act in the interest of the users, and this cannot be promoted without spaces for popular participation and debate, which foster users empowerment with regards to the various aspects of the electric energy public service. The alliance between energy workers and users is not only needed but also strategic.” The document also states that it is a historical need for unions in the region to add to their programmatic action the “workers and users’ political participation in public service management,” as active members taking part in debates and decision-making processes about the state-owned companies’ strategic course, and economic planning. One of the pros of this campaign, according to Castelgrande, is that the company is still state-owned, in spite of the privatization offensive. He emphasized the close relationship between the Uruguayan State and the workers, which has always created a favorable environment to improve the living conditions of popular sectors. However, he observed that any attempt at change entails an amendment of the law, which depends on the government’s political will. 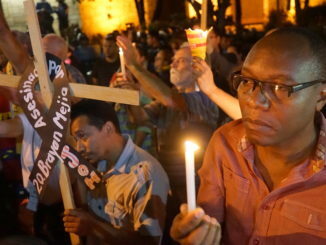 In that regard, he reminds us that in the Council of Ministers, Uruguayan President Tabaré Vázquez announced a reduction in electricity rates for rice and dairy farmers because, “it is very expensive for them,” he said. “Yet they are still subsidizing big companies, and that kind of political will is making it very difficult to reduce rates or increase access and the people’s right to energy,” stated Castelgrande. On the other hand, Aute’s under secretary believes it is urgent to take up the renewable energy discourse from a workers perspective, in order to lay bare the private capital offensive behind clean energy and reveal green capitalism policies. “They have taken possession of our renewable energy discourse. 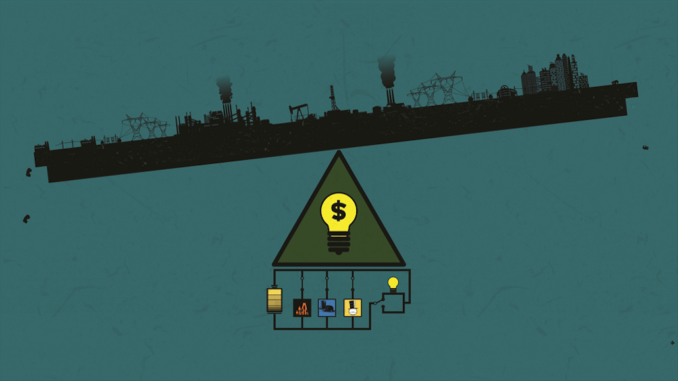 The working class together with popular sectors has debated the relationship between production [of energy] and the environment. It has been years since we brought this up and now capital appropriates this discourse to implement its privatization policies through clean energy generation,” he stressed. The Declaration summarizes the horizon of Aute’s struggle. It is on that path that the union ?seeks to push down current residential rates while reaffirming that access to energy is a human right and energy resources are a public good. Ariana Ortega holds a B.A. in Political Science from the University of Buenos Aires. She is part of Observatorio Petrolero Sur, Energy Sovereignty team, and vice-director at CEPPAS (Center of Public Policies for Socialism). She also collaborates with different organizations on gender-related issues with a feminist perspective. Gabriella Sinelli is a Technical and Scientific translator based in Argentina. This article was originally published in Opsur’s magazine, Fractura Expuesta #5. 1. Soto’s statement was taken from his statement at the Energy Sovereignty Alternatives Encounter hosted by Opsur in Buenos Aires on November 27, 2016. Aute (2016). Analysis of the electricity rates, Montevideo. National Office of Nuclear Technology (n.d.), National Energy Policy 2005-2030, Ministry of Industry, Energy and Mining, Montevideo. International Meeting of Energy Workers (2017). Declaration of Montevideo, April 22nd, Montevideo. La Diaria (01/27/2014). Corriente Alterna, Montevideo. Observatorio Petrolero Sur (2016). Meeting recordings: Energy Sovereignty Alternatives Encounter, November 24, Buenos Aires. Uruguay XXI Investment and Export Promotion (2016). Investment opportunities in Uruguay. Renewable energy in electricity generation, February, Montevideo.